The 25th of April is Anzac Day, an important date in the calendar of Australian patriotism, which commemorates the landing of the Australian forces at Gallipoli in 1915, as well as being a time to remember the sacrifices of the Australian military in all wars. Lots of people say that they honour the sacrifices of our military forces, and solemnly intone “Lest we forget”; but the fact is — they have forgotten. 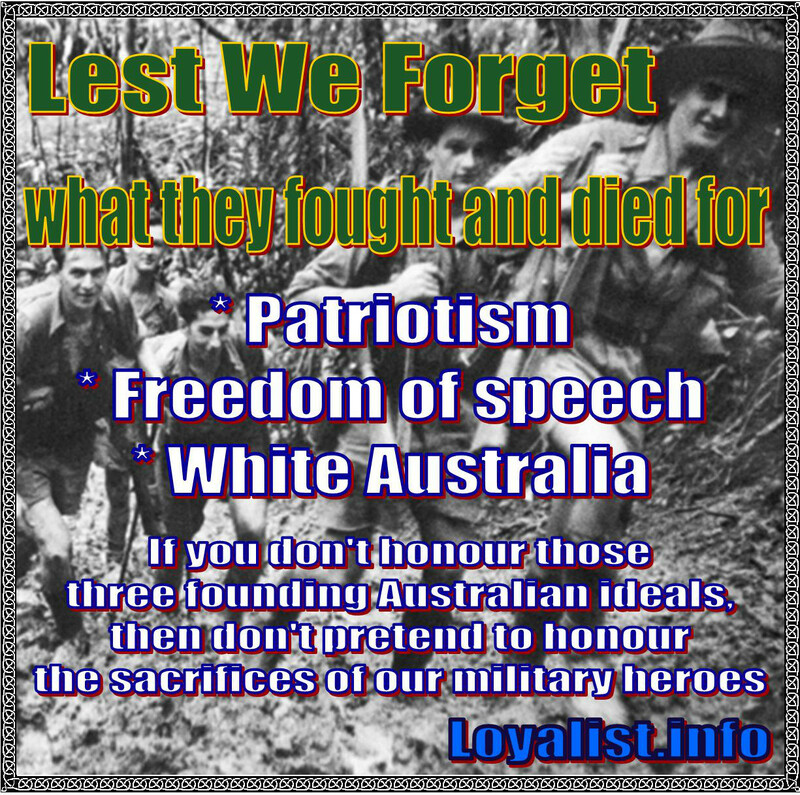 The men who went off to fight in the service of Australia primarily believed in an Australian democracy, freedom of speech, patriotism, and a White Australia. It was for those ideals that they fought and died. The Australians went to war in World War One and World War Two to fight for the Australian nation and the British Empire (which was basically designed as a grouping of kinfolk nations). Democracy? Not so great. There are laws now in place to stop people talking about the religious and racial fallout from the realities of Multiculturalism. As well as which, the Multiculturalists have enacted dodgy laws designed to hinder small parties from engaging in the electoral process. Freedom of speech? Not so much. Religious and racial vilification laws are in place to stop a full public discourse on those issues. People risk fines, financial ruin, and/or jail simply for speaking their mind in public. Speeches given by our early Prime Ministers could land them in court and/or jail if they were alive today. Patriotism? No. 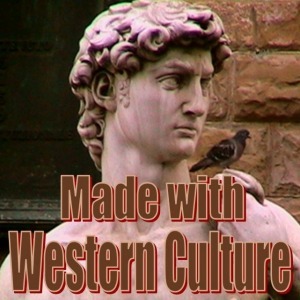 The political establishment propagates a “Multiculturalist Patriotism”, which is not a patriotism at all, but rather a form of globalism with a patriotic mask. Multiculturalist Patriotism consists of waving the flag (which the Multiculturalists want to change), cheering at sports events, and pretending to care about our military icons. White Australia? Absolutely not. The Multiculturalists hate the very idea of the White Australia Policy. However, the fight for that very policy was an integral part of the Australian psyche; it was supported by the overwhelming majority of the Australian people. In fact, a White Australia was one of the primary founding ideals of our nation in 1901. The Anzacs would be horrified if they could see what the Multiculturalists were doing to Australia. The Multiculturalists are spitting on the graves of the Anzacs. Don’t listen to their lies when they say that they honour our dead — because they don’t. The Multiculturalists don’t give a damn about the Anzacs or the men and women who built Australia; all they want to do is to destroy the foundations that this country was built upon. We don’t want any false patriots, we need real ones. 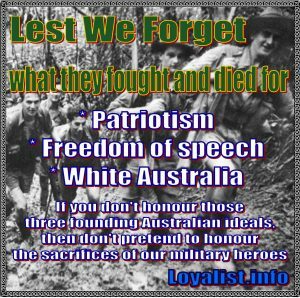 If you truly believe that our military men and women should be honoured, then fight for an Australian democracy, freedom of speech, patriotism, and a White Australia. Nothing less will do. To all those Australians who fought and died for our nation — we remember you, and we honour you by fighting for the foundation ideals of our nation.